Thank you!! 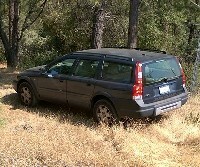 I just tallied up using Volvo only parts and its almost $700. About $550 with what I have. XC70Rider set up adds about $70 to my original cost and I think I would rather have metal where metal is. Updated parts list. All I need is the wife's W-2. Got mine already. State returns come quick usually. Above is a lot to handle in one setting unless you've help. I drive 200-1000 miles before taking on next task. Sounds like sound advice. Thing is, my PCV system is plugged and inoperative. Maybe switch the procedure? A plugged PCV should absolutely have priority. There is a convergence of crankcase, timing, and cooling. Prioritizing is a VERY good idea. Agreed. And I don't believe in portioning those important repairs out. Do it all at once while you're there. PCV plus complete timing belt is still only a day's work. The accessory belt and PS pump has to come off for the thermostat anyways. Then getting the intake manifold off will be easier with the thermostat out of the way. woo hoo!! Parts on order!! I'll ask here but may start a new thread. When installing the timing belt the tensioner is heat sensitive? Pretty sure I'll be a good 4 or 5 hours into the job when I get there? Would that be long enough to be "cold"? In CA just stick the gauge I the middle of the range, it's not that critical.